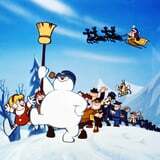 The 1969 animated Frosty the Snowman film will go down in history as one of the best holiday films of all time, but it will also go down in history as one of the films that scarred me (and apparently many others) most as a child. I was probably around 7 or 8 when I first saw it on TV. My favorite Christmas movie at the time was How the Grinch Stole Christmas - I've always appreciated how deliciously petty he is, robbing people blind because they dare to be in a good mood - but I thought watching something "lighter" and "happier" with no "sad parts" would be a nice departure. Boy, was I wrong. Spoiler alert: Frosty dies. He is viciously murdered by an evil magician named Professor Hinkle, who wants Frosty's magical top hat so badly that he traps him and his friend Karen in a greenhouse while she tries to get warm from the cold. I grew up in Boston, so I was quite familiar with the concept of snow melting and leaving water behind - which is why, when Frosty walked into that greenhouse, I knew he wasn't going to come out alive. And I cried. I cried a lot. Frosty was just too good of a soul; he cared so much about Karen that he sacrificed his own holly, jolly life to keep her warm. And now he's dead, and Karen has to live with that guilt for the rest of her life. How many of your friends would melt for you? !